WAG commenced operations about October 2011 collecting donations to assist with water wells in South Sudan. About 2013, people in the parish were concerned that there were fellow Queenslanders 'doing it tough' in the bush because of the prolonged drought. As a team, we decided that we should do something positive to assist with this situation. At times, we collected for this purpose and sent money to various St Vincent de Paul conferences in drought areas. 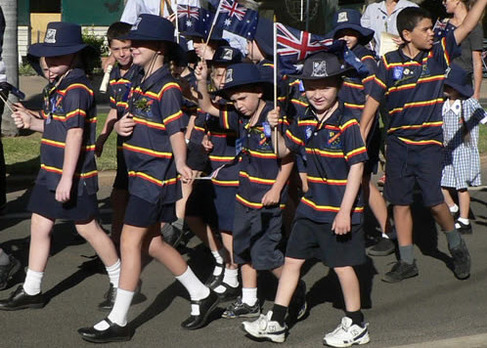 Towards the end of 2015, many parishioners were suggesting that we should be doing more for our farmers and so through the Bishop of Rockhampton, we asked which country parish was doing it the toughest and the final result was Blackall / Tambo (BT) parish. It took some time to finally get things in place, because like a lot of Australians, the people of BT were reluctant to accept help. But all that changed when some energetic members of our WAG team decided to make things happen. 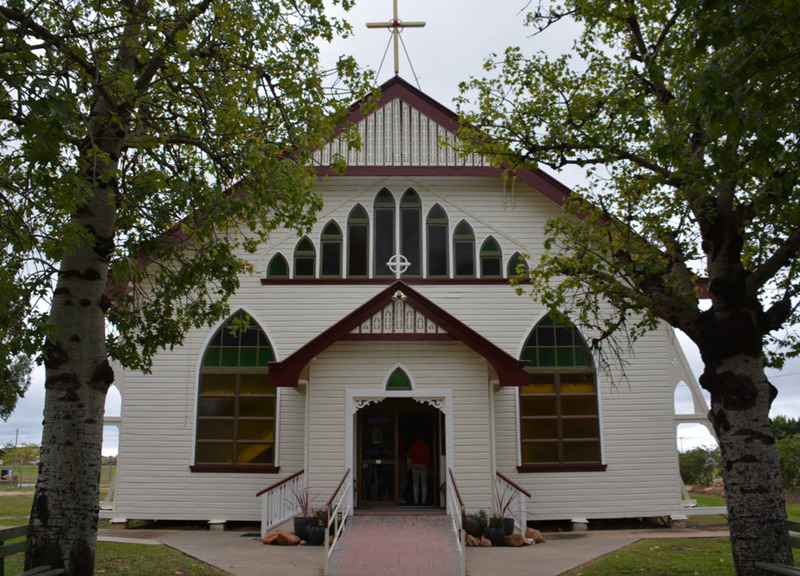 Parishioners from Bracken Ridge visited the BT parish and apart from building many friendships with the locals, found there were needs to be filled out there. Books to be re-bound, PA systems to be fixed and generally much general assistance. To keep the water based theme of our collections, this time we sourced two watering cans to make collections at Masses for the BT Parish. Funds were raised and assistance is being forwarded monthly to BT Parish. In the beginning, to assist with the BT Parish Fete, we started with three of our “grey nomad” couples hitching up their vans to make the journey to Blackall setting up some stalls like “Craft” and “Ring a Coke”. And each year we continue the wonderful pilgrimage for the annual BT Parish Fete. 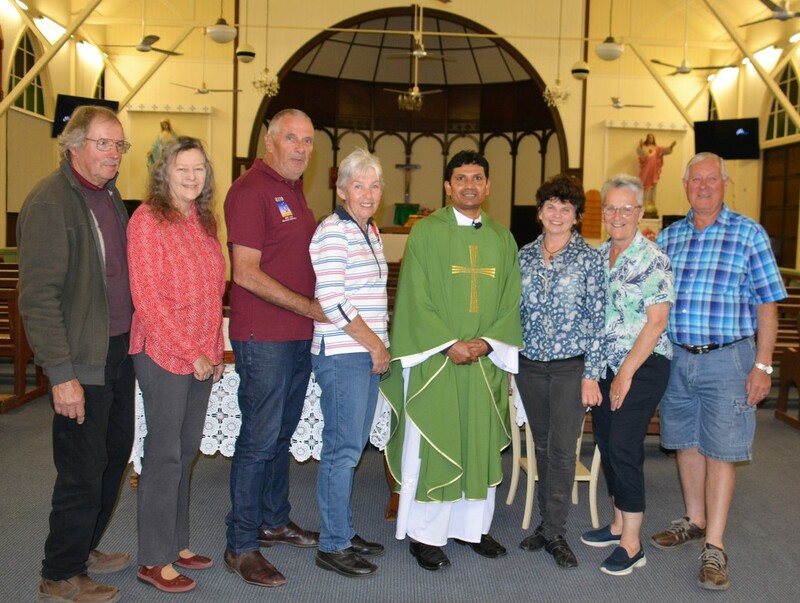 Fr Jayanthi and Moira Kent on his left, with visiting supporters from St. Joseph & St. Anthony Parish Bracken Ridge L-R Jan, Therese, Joe, Corry, Sharyn and John (2018).